What’s the Hidden Story Behind American Muslim Poverty? Muslims in America fare better socioeconomically than other minority Muslim populations around the globe, such as French or British Muslims, on average. This point has supported claims that American Muslims are well-integrated and “mostly mainstream.” The ever-expanding universe of successful Muslim entrepreneurs helps further this narrative. This story, however, masks the tale of American Muslim poverty. 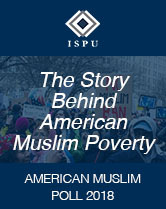 In order to examine poverty among American Muslims, we dug deeper into the data of ISPU’s 2018 American Muslim Poll. Even though some American Muslims are quite well-off, a significantly larger percentage of the community struggles financially. 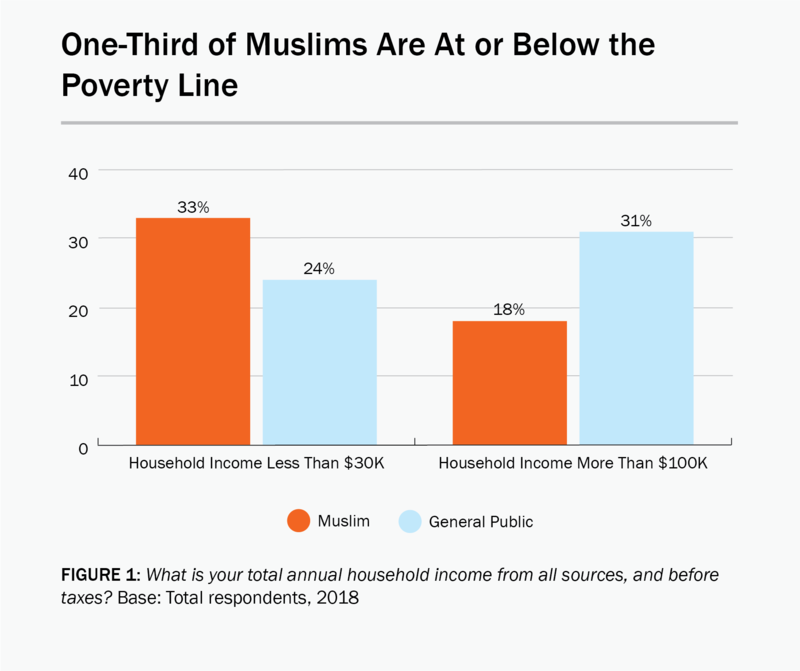 In fact, in its most recent poll, ISPU found that 18% of American Muslims report a household income above $100,000 (compared to 31% of Americans generally), but 33% make less than $30,000 (compared to 24% of Americans generally), a level at or below the federal poverty line, depending on household size. This reality is brought into stark relief as more data emerge and scholars shine a light on the effects of economic disparity in this community. American Muslims are incredibly diverse, so we examined the demographic factors that are correlated with low- and high-income households in ISPU’s 2018 poll to understand how communities differed. For the purposes of this analysis, “low income” corresponds to less than $30,000 while “high income” indicates those earning at least $75,000 a year (i.e., well above the median American annual income of approximately $60,000). Figure 1 plots the most relevant household-level variables linked to high or low income. We found that, controlling for household size and geographic region, Black Muslim households are more likely than any other Muslim racial group to earn less than $30,000 a year. 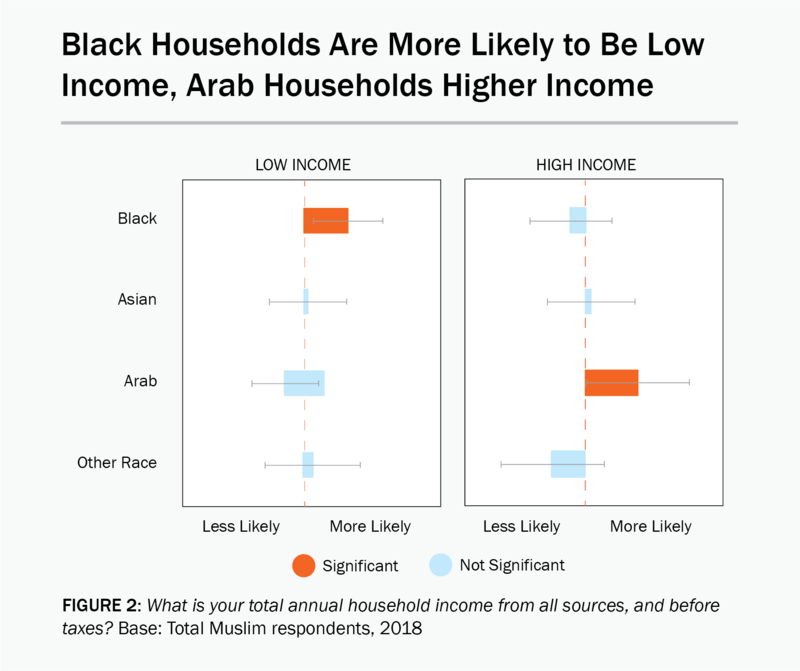 More racial parity exists at the higher end of the income spectrum, with Arab households only slightly more likely than other Muslims to report incomes over $75,000. Note: These values are 95% confidence intervals. Since we asked survey respondents about their household income, individual level characteristics are not as easy to interpret. Controlling only for household-level variables (race/ethnicity, household size, and geographic region), Figure 2 presents correlations with low and high income when at least one member of a household has the characteristic in question. Education strongly correlates with income, as it does in the general public. Homes with at least one college graduate are both less likely to fall below $30,000 in annual income and more likely to earn over $75,000. Education and income are generally among the most strongly correlated sociodemographic variables, so it is no surprise that the pattern holds for American Muslims. This trend is also evident for households with a married couple, which again makes sense given the increased likelihood of both spouses earning an income. The one variable that demonstrates an inconsistent effect between low and high income is citizenship status. Households with at least one non-citizen are more likely to earn below $30,000 but no less likely to have annual earnings above $75,000. In other words, recent immigrant households may comprise individuals starting anew and looking for a better life for their family (the classic immigrant tale), or, alternatively, may feature highly skilled workers looking to apply their talents in America. These results offer somewhat mixed expectations for American Muslims moving forward. 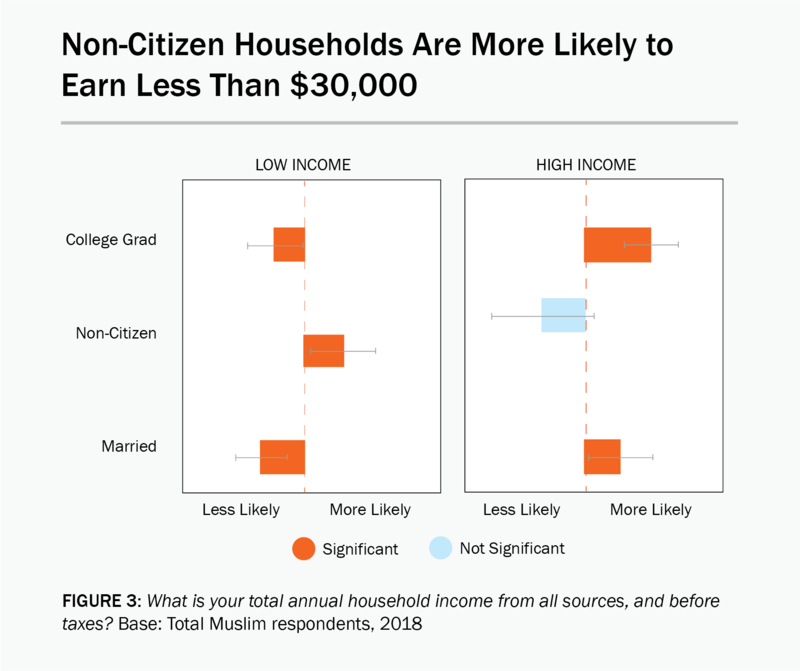 On the one hand, the finding for non-citizens in Figure 2 suggests that although many immigrants who are Muslim come to America with limited means, a number of them are also starting off as high earners. Moreover, the education-to-income pipeline appears just as viable a track for Muslims as all others in America. On the other hand, the findings that Black Muslims lag behind other American Muslims offers less hope for progress over time. Indeed, the comparatively fewer resources for social mobility available to Black Americans means that any remedy will likely need to be community-driven rather than rely on societal progress. One positive point in this regard, highlighted in ISPU’s 2017 poll, is that half of American Muslims contribute to domestic causes aimed at alleviating poverty. Thus, the foundation seems to be in place for more institutionally grounded solutions that, in addition to philanthropic endeavors, address the need for more economic cooperation between Muslims of different socio-economic and ethnic backgrounds. Youssef Chouhoud is an assistant professor of political science at Christopher Newport University, where he is affiliated with the Reiff Center for Human Rights and Conflict Resolution. He is an ISPU Scholar and was the co-author of ISPU’s 2017 and 2018 American Muslim Polls.